Filmless doesn’t mean paperless, but facilities are seeking IT applications to approach that objective. Converting paper documents into a format acceptable to store in a PACS is a widespread need. Imaging facilities use several approaches to solve this common problem, including using DICOM, RIS, or EMR document management. The problem varies depending on the institution and its method of paper management, says Dennis Forgione, regional sales director for Etiam, a French-based enterprise that develops systems to bring paper into the digital imaging and records management environment. Etiam seeks to offer appropriate solutions to facilities with different needs and abilities. Its customers run the gamut from stand-alone imaging centers to university hospitals and major healthcare systems. Etiam’s solutions approach the paper conversion several ways. Its Print-In product is a virtual printer that sends documents directly into PACS. Installed on a computer that runs Windows, Print-In enables easy document importation. He provides a specific case that serves as a representative success story: The Guilloz Imaging Department at Nancy University Hospital. The department conducts osteoarticular imaging studies and interventional radiological services at this institution, which is located in the Lorraine region of France. The document and imaging importation into patient records led to wasted time. PACS administrator Nicolas Labonne regularly integrates documents into PACS for distribution and archiving within the institution. Specifically, he handles nuclear medicine reports, digital photographs, and specialized imaging. He says with the technology, it takes only a few seconds to import data when it previously took several minutes to perform the same importation tasks on workstations. Minutes add up to hours, and hours translate into wasted time and money. When a document is available in only a paper format, Etiam’s DICOM Izer product offers a solution. “Often, the only thing people have is the actual paper in their hand. To get that into PACS, you need to digitize the paper document. You’ll need a standard office scanner, and you can connect that scanner with our DICOM Izer product,” says Forgione. In this way, DICOM Izer, like Print-In, facilitates communication by enabling information to be subsequently and easily disseminated where necessary. 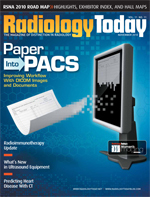 The technology integrates paper documents and forms using desktop scanners as well as digital images files (eg, JPEG, GIF, TIF) from digital cameras and radiology films and digital motion videos. HIPAA compliant, the technology helps medical facilities attach greater traceability to patient data and increases safety. Eagan, Minn.-based Sorna Corporation has also developed innovations that facilitate document and image conversion and, in turn, easier information dissemination. The company designed its products to reduce costs, increase productivity, and adhere to DICOM and IHE standards. Sorna’s core product is the Reviewer software suite, which it developed to address a specific medical industry need (eg, importing CDs into PACS, burning a CD for sharing, accessing images). But as far as document conversion, the R-Scan and the 2DICOM editions are the most appropriate solutions, according to Cyrus Samari, Sorna’s vice president of sales and marketing. Sorna built on this base with the Reviewer 2DICOM, adding a Drag & Drop DICOMization functionality to the R-Scan technology. This means document files and images can be dragged and dropped into a window for immediate DICOMization. Ultimately, this functionality eliminates the need to have an application installed when printing to DICOMize. The R-Scan and the 2DICOM both provide consistency across an enterprise, a phrase that forms the company’s credo. With the Reviewer products, whatever tasks the users perform—scanning and importing paper documents, DICOMizing image formats, importing or burning CDs, or a host of other tasks—everything necessary is included in the same application. Another player in this market segment is ABBYY, an international organization with U.S. operations located in Milpitas, Calif. The name may be unfamiliar to some medical professionals, as the company made its name by serving the government, financial services, insurance, and transportation sectors, among others, but it found its technology readily translatable into the medical arena. “For healthcare customers, we can help them convert paper-based documents that become exportable into any system they have deployed in their enterprise,” says Julia Levites, product marketing manager for ABBYY USA. Among the management and capture solutions that serve its medical customers, ABBYY offers the FineReader, an optical character recognition software that provides text recognition and enables creation of electronic files that can be searched and edited. FineReader can be used with paper documents, PDFs, and digitized photographs. The company also offers the PDF Transformer 3.0, an intuitive tool that enables rapid conversion of PDF documents into formats easily edited while simultaneously saving the original layout. Other products include the Recognition Server 2.0, which, as the name implies, is a server-based solution. Designed for mid- to high-volume document processing across large departments and enterprises, it’s deployable as both a stand-alone program and as part of a third-party PACS. But ABBYY’s best achievement in this area may be the FlexiCapture 9.0, a scalable data capture and document processing system that provides a single entry point. “It easily and readily converts large volumes of documents into useable data,” Levites says.